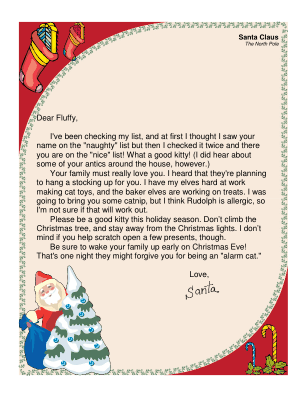 Good little kitties (and even mischievous ones) are the intended recipient of this printable letter from Santa, which urges Christmas cats to stay away from the tree. Your family must really love you. I heard that they're planning to hang a stocking up for you. I have my elves hard at work making cat toys, and the baker elves are working on treats. I was going to bring you some catnip, but I think Rudolph is allergic, so I'm not sure if that will work out. Please be a good kitty this holiday season. Don't climb the Christmas tree, and stay away from the Christmas lights. I don't mind if you help scratch open a few presents, though. Be sure to wake your family up early on Christmas Eve! That's one night they might forgive you for being an "alarm cat."